Clean Your Electronic Screens with #Clorox #iShine Electronic Cleaning Wipes! I remember when we got our first flat screen TV. One thing for sure, don't ever have it so that it's reachable for your toddlers to color on with a crayon, this happened to us until I finally got my hubby to mount it to the wall, a few years later, lol. One of the items we were given when we bought our flat screen for our family room was a microfiber screen cleaner. At first I thought, what's the use of this, but then after seeing finger prints and crayon marks on the screen I got exactly what the purpose of the cloth was for. Now fast forward a couple of years later, we not only have our television to worry about, we also have our laptops, ipads, iphones and any other touch screen smart phone, the kid's Nintendo DS screens and so much more that we need to worry about leaving finger prints or marks on. This is why I was pretty excited to get a few samples of Clorox's new product called, iShine. iShine is part of Clorox's new e-cleaning products that are safe for electronic displays and touch screens, perfect for getting sticky fingerprints, dust and dirt off phones, computers and laptops. The cleaning wipes and cloth worked great and I'm super excited that I got enough samples to not only have for my household, but to share with friends and family members. This was easy to use and the kids loved that they could clean their screens on their Nintendo DS. 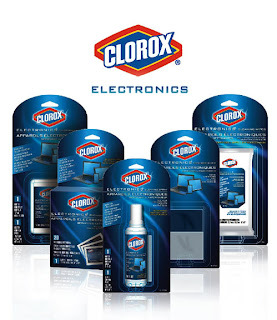 A great new product from Clorox I'm sure everyone with any type of touch screen device would love and could use! Be sure to look out for them this Fall at your local stores! Disclosure: All opinions are my own. I received samples of the above mention product at no cost. No review was obligated. No other compensation was received.